My garden's focal point now looks really good since the plants have grown. 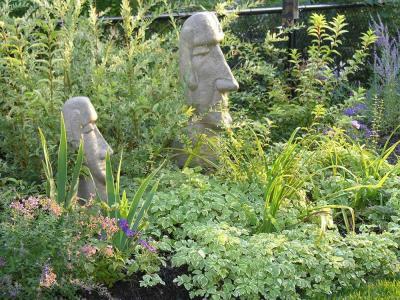 Notice the backdrop to the focal point and how the plants in the foreground just blend in to make it look like the stone heads have been there for ages. I have also used mulch as suggested by Alison to cover the bare soil and to provide future nourishment for my plants.